There are around 110 species of pterosaur currently known in about 85 genera. The talk here of 'genus' and 'species' comes from the way in which biologists give all organisms two names (so called 'binomials'): it's well known that we refer to ourselves as Homo sapiens, with the genus name being Homo and the species being sapiens. A genus can hold several species: there are several species of Homo, for instance (H. neanderthalensis, H. erectus and H. habilus), and species can also be further divided into subspecies. Vertebrate palaeontologists typically use genus as their primary taxonomic unit, however: most genera have only a single species. Therefore, we often only use the genus name in discussion of fossil taxa: you often hear talk of Pteranodon rather than specific reference to either of the two species recognized in this genus, for instance. The number of recognised pterosaur genera and species is always changing as new species are discovered and old names are removed from use when it becomes apparent that two names have been given to the same species. For example, the ornithocheirid 'Tropeognathus' was recently sunk into (or 'synonomised' with) the genus Ornithocheirus as there are not enough differences between the two genera to warrant separate names. Because the earliest name given to any species takes priority in taxonomy, the older name Ornithocheirus is retained while Tropeognathus is abandoned. Here various members of the Pterosaur.net team give you some (very) brief descriptions and details about a handful of the more common, famous or bizarre pterosaurs. Our list is short at the moment, but we hope to provide more comprehensive coverage soon (suggestions for genera you'd like to hear more about can be mailed to us here). Check out the gallery for restorations of some taxa discussed here and fossil gallery for images of the fossil material that gave rise to some of these forms. 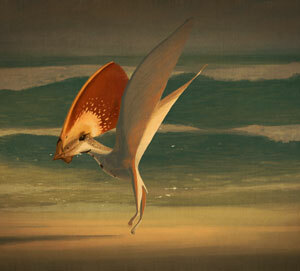 For more information about pterosaur relationships, go to this page. Britain's first pterosaur (found in 1828, history fans), Dimorphodon is a moderately-sized basal pterosaur with a wingspan of 1.2 m. Its head is quite enormous for its body size at around 20 cm long and, with its considerable depth, has a hatchet-like appearance. Compared to other basal forms, Dimoprpodon's hindlimbs are long and robust and while its wings are relatively short. The feet and hands are large with with strong, deeply-curved claws and all digits, save for those supporting membranes, possess sesamoids that would aid extension of the claws. 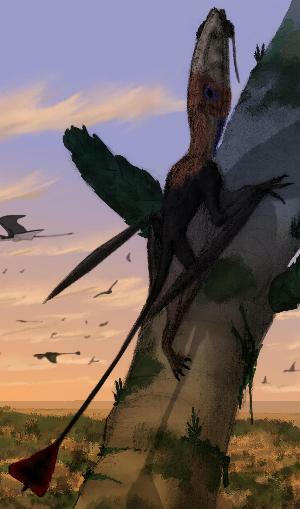 The large head, long legs and robust appendages come at some cost, however: several studies have found Dimorphodon to be particularly heavy for its size and it may have resultantly been a relatively poor flier . 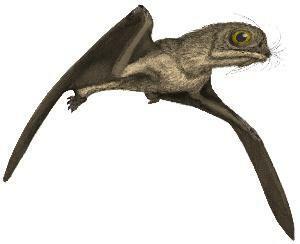 However, the climbing abilities of Dimorphodon are likely to be greater than those of all other known pterosaurs, suggesting it was quite capable of scampering around treetrunks or cliff faces and may have only used flight to cross large open distances or escape predators. The potentially limited flight abilities of Dimorphodon and its lack of swimming adaptations suggest that, unlike the puffins it superficially resembles, it may not have dined on fish or squid: rather, the varied dentition of long, spear-like teeth at the jaw tip and smaller, blade-like teeth along the remaining jawline may have apprehended insects or small vertebrates. This rhamphorhynchoid pterosaur was only discovered very recently in Late Triassic rocks from Switzerland. It has some truly bizarre features that make it unique among pterosaurs — the large bony crest is on the snout is not that unusual, but the "keel" on the lower jaw certainly is, and the shape of both the humerus and femur are bizarre, in addition to the unusual arrangements of the teeth. We have much to learn from this pterosaur and it could tell us a huge amount about early pterosaur evolution — we'll let you know. From the Upper Jurassic Solnhofen Limestone of Germany, Anurognathus belongs to a group that consisted of some of the earliest pterosaurs. These animals deviated significantly from the basal body plan of other pterosaurs by reducing the long tail down to small structure, akin to that seen in Pterodactylus , and developing a squat broad skull, as well as only three phalanges in the wing finger. 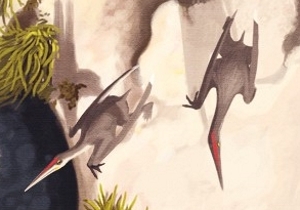 These were small pterosaurs with a wing span of around 45 cm or less and are interpreted as being aerial insectivores, catching their prey around dawn or dusk when low light conditions would make good use of their large eyes. From the Early Cretaceous Inner Mongolia, China this pterosaur is closely related to Anurognathus which, along with other taxa, form the Anurognathidae, a very basal group of pterosaurs. While it is similar to Anurognathus in having a head wider than it is long and the loss of a long tail it also differs by being significantly larger, with a wing span of 90 cm and preserving the fourth phalanx of the flight finger. Like Sordes it is covered in hair-like fibres from the head to the hind limbs termed "pycnofibres." The flight membranes themselves were probably mostly free from such structures. As with other anurognathids Jeholopterus it is believed to have caught insects on the wing possibly under low light conditions. This long tailed pterosaur is one of the most abundant pterosaurs fossils from the Late Jurassic of southern Germany. The genus is also reported Switzerland, England, Africa and possibly the USA. Some specimens provide the best record and most detailed on soft tissue of pterosaurs and helped a lot for understanding the life of pterosaurs in general. We know that body and beck of Rhamphorhynchus was covered in fur consisting of coarse bristles. The webbing of the feet was supported by fibrils similar to the prominent aktinofibrils that stabilised the flight membrane. The wing finger is probably the longest with respect to the arm part of the wing of all pterosaurs known to date. The small hind limbs were integrated in the membrane, resulting in and exceeding long but narrow wing membrane, which in some cases even preserves traces of muscles and blood vessels. The end of the tail bore an asymmetrical diamond-shaped tail vane, the orientation of which is still unclear, despite most scientists assume a vertical orientation. The uropatagium was spanned by the fifth toe and attached to the basal tail vertebrae forming a kind of swallow tail. The wing span of Rhamphorhynchus reached about 1 metre. The pointed, needle-shaped teeth faced forward and together with the upward curved toothless rostrum formed kind of a harpoon with multiple pins. The gastric content shows a fragmentary fish in one specimen, but it remains unclear if this fish was collected dead or alive. Most likely, Rhamphorhynchus seized all kind food from the water surface similar to extant sea gulls. How many of the five described species from the Solnhofen Limestone are valid is still under debate. 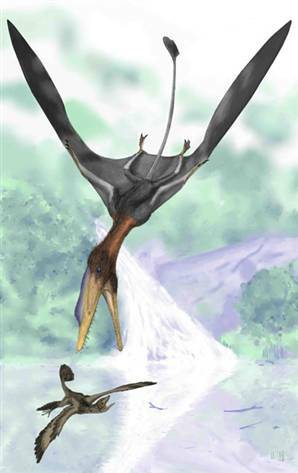 This pterosaur has been uncovered from the Upper Jurassic lake deposits of the Karatau Mountains in Kazakhstan. Like many pterosaurs we now know of Sordes was covered in an extensive coat of pycnofibres which has been suggested as being indicative of a warm blooded physiology. The animal was small, with a wing span of only 63 cm but had a very extensive wing membrane that attached from the wing all the way down to the ankle as well a broad uropatagium or rear-flight membrane. The tail is also unusual as it preserves a long, narrow, vein-like structure towards the tip, similar to those seen in Rhamphorhynchus. This Chinese rhamphorhynchoid pterosaur from the Jurassic has a very interesting soft-tissue crest on its head. Since there is no bone at the base to support it, it is possible that other apparently crestless rhamphorhynchoids may have in fact had similar crests that have simply not been preserved. In other words, far more taxa than we currently realize may have had crests. The pterosaur poster boy of 2009, Darwinopterus is one of the most significant finds in pterosaur research for many years. Stemming from middle Jurassic deposits of China and measuring 0.7 - 1.0 m across the wings, its anatomy is simultaneously unremarkable but enormously interesting. The body and wings are very typical of rhamphorhynchid - and specifically scaphognathines like Pterorhynchus - pterosaurs, complete with a long, stiffened tail, short metacarpals and bent fifth toe bones. The head and neck, by contrast, are 'classic' pterodactyloid: the skull bears a combined nasoantorbital fenestra, the cranium is reclined and the teeth are simple and peg-like, while the neck vertebrae are long and simplified. Taken apart, these elements aren't that exciting, but their occurrence in one species is quite remarkable. Darwinopterus provides clear evidence that pterodactyloids evolved from rhamphorhynchid-like ancestors and that acquisition of pterodactyloid characters began from the head down with selection pressures operating on very specific portions of basal pterosaur anatomy. This, of course, means that some doubt has now been extended over the identity of some headless rhamphorhynchids and bodiless pterodactyloids: how can we be sure which side of the line they fall on when Darwinopterus shows us that pterodactyloid evolution occurred in such a regimented fashion? Speaking of which, Darwinopterus has also been touted as good evidence of modular evolutionary processes, a model of evolution in which clusters - or modules - of genes can change with minimal effects on others. This can lead to significant alterations of specific aspects of an organism's bauplan with no noticeable change elsewhere: modification of the head and neck without affecting the body, in this case. Clearly then, this is a remarkable little critter: you can read more about it here and here. About 36 Ornithocheirus species have been described, but recent reviews yielded just three species to be valid. While the holotype is a poorly preserved fragment of a rostrum from the English Late Cretaceous, the coeval NE Brazilian Santana Formation yielded several complete skulls and a postcranial material. Some fragments of a wing suggest that Ornithocheirus could probably reach a wing span of around 10 metres. Most material comes from animals with wingspans about 5 to 6 metres. The flight apparatus consists of an enormous wing finger with respect to the proximal wing elements. The hind limbs are tiny compared with the wings. As a consequence, the wing was long and narrow, indication abilities for dynamic gliding over the sea. The rostrum is elongate pyramid-shaped with strong, conical teeth which are longest at the front. The front ends of both upper and low jaw are vertically expanded by near semi-circular crests. The closed margins of these crests indicate that there was no evident soft tissue expansion. The most conclusive role of the bony crest for the moment is that they increased the snapping speed by forming a distal mass, accelerated on long levers. As is indicated by fossils Ornithocheirus could have been cosmopolitan, roaming the Tethys on the search of food no matter if alive or dead. Ornithocheirus means ?bird hand?. This pterosaur with its fierce dentition consisting long and pointed recurved teeth might have had a wing span of about 4 metres, but is only know from its skull, which was found in the Late Cretaceous Crato Formation in NE Brazil. The name derived from a toy pterosaur, which had the occipital head crest of a Pteranodon but pointed fangs like an anhanguerid pterosaur. Ludodactylus proved that such a combination did really exist. The blade like occipital crest is identical in shape to that of Pteranodon ingens, but the rest of the skull proves a close similarity to Anhanguera from the Brazilian Late Cretaceous Santana Formation. This enigmatic pterosaur preserved its cause of death. A hard leaf is still sticking in its throat pouch lateral to the tongue. With a wing span of about 5 metres, Anhanguera was a medium sized Late Cretaceous pterosaur. Many specimens of this pterosaur are reported from the NE Brazilian Santana Formation. Amongst numerous fragmentary fossils almost complete specimens of different age stages occur, mostly preserved in three dimensions. The rostrum of Anhanguera is triangular in cross-section with median crests arising from upper and lower jaw. The younger the individual, the lower are the crests. With the age, especially the crest of the upper jaw becomes a prominent blade which may be higher than the skull itself. The fangs in the front part of the rostrum reach impressive sizes. They are slender, recurved, interdigitate and form kind of a basket, which was suitable for piercing but also for grasping small food items similar to spaghetti tongs. Like in other pterosaurs from the Santana Formation there are two kinds of pelvic girdles. One is ventrally open and could be referred to females, the other is sutured ventrally indicating a male. Among the best known of the larger pterosaurs, with hundreds of specimens known (though mostly dismembered and crushed). They were toothless and known for the extensive bony crests that grew on the back on the heads of several species. Pteranodon is a Late Cretaceous genus, and is best known from the Niobrara Chalks of Kansas in the United States. This region was once a part of the Western Interior Seaway, and Pteranodon appears to have been a marine species. Pteranodon could be quite large, with wingspans of roughly 7 meters recorded for some specimens. Nyctosaurus were, like Pteranodon, toothless marine feeders known mostly from the interior of the present-day United States (when this region was a shallow seaway). Nyctosaurus was a champion of crazy crests: at least one species, as adults, formed a massive branching crest with bony spars longer than the rest of the animal. The crests appear to have only grown on adult individuals; it is not known if they were sexually dimorphic (with females and males producing different crests). Nyctosaurus had a wingspan of about 2.7 meters, and was probably a highly efficient marine soaring species, like Pteranodon. This genus is known from a large variety of specimens, some of the perfectly preserved with flight membranes and bristles around neck and chest. The conical skull is long and slender. Its jaws bear a row of short pointed teeth. The very tip of the rostrum bears a sharp curved keratinous hook. Along the dorsal midline of the skull a fibrous soft tissue crest arose which was stabilised by a dorsally curving occipital cone. The feet were extensively webbed. Some isolated remains suggest that Pterodactylus could reach a wing span of about 1.2 metres, but most remains com from animals with a wing span around 0.5 metres. Its diet likely consisted of small animals which were either collected on the wing or during walking along the shore. A variety of pterosaur track from the Late Jurassic limestone of Crayssac in France have been referred to Pterodactyluss-like pterosaurs. The species Pterodactylus was the first pterosaur ever to be described and is mainly reported from the Late Jurassic of Germany. The name means ?comb mouth? due to the numerous needle-fine teeth in its long slightly upward curving rostrum. This kind of dentition suggests that Ctenochasma was a filter feeder, which could have fished tiny animals, e.g. crustaceans of fish larvae out of the water. The minimum size of prey items was determined by the distance between two teeth to less than one tenth of a millimetre. Unclear is whetherCtenochasma fed on the wing of foraged by staking through shallow water. 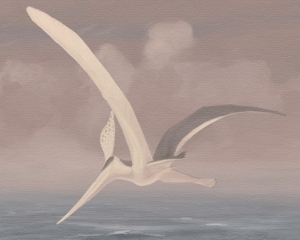 Of all Late Jurassic pterosaurs, Ctenochasma has the longest hind limbs with respect to its wings, which results in a very broad proximal part of the wing, indicative for an increased manoeuvrability. The three proximal fingers are short and stubby. The wing span did not increase 0.5 metres. Ctenochasma is rare compared to other Solnhofen pterosaurs, though specimens were found in the Late Jurassic of Germany and France. The name just means Wing of the South, but the pterosaur must have looked like a toothbrush with wings. 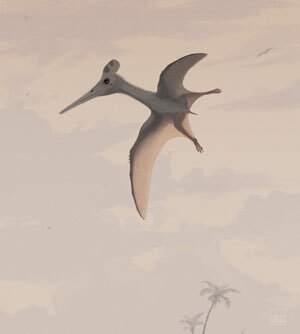 With a wingspan of about 1.3 metres, Pterodaustro was a small pterosaur for the Creataceous. The upward curving snout is one of the longest with respect to the orbital part of the skull but by far has the most tooth positions of all known pterosaurs with more than 1000. The long, hair like teeth of the lower jaw together formed an extra fine filter, which, due to the flexible nature of the teeth, could only hold back plankton. The filter teeth were about five times the height of the upper jaw, the dentition of which consists of very short, but equally fine teeth like the lower jaw. Very likely the upper jaw with its dentition formed a brush, which brushed off the plankton sticking to the inner surface of the mandibular filter. If Pterodaustro fished on the wing, its flight must have been very slow due to the friction of the filter teeth. Probably the animal foraged in shallow waters. For feeding, the curved rostrum was likely pushed forward and the water entered between the mandibular tooth rows and escaped between the teeth in the back of the jaws. After several pushes enough plankton was accumulated between the mandibular teeth to be brushed into the mouth cavity and forced down throat with the tongue. 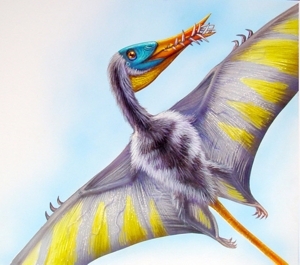 Pterodaustro is only known from the Early Cretaceous of Argentina. The fossil record comprises several specimens including hatchlings and embryos in beautiful preservation. This taxon has long confused scientists and its exact relationships are unknown, though it probably represents an early member of the dsungaripterid family. It is known from the Late Jurassic beds in Germany and would have lived among the far more common Pterodactylus and Rhamphorhynchus and others. It was relatively large for the time, reaching around 80 cm in wingspan and fed on small snails and similar invertebrates which it could crush with its thick, blunt teeth. The ridge of bone along the top of the skull supported a crest. Some researchers do not thaink that Germanodactylus belongs with the other dsungaripterids and instead might be closer to thinks like Pterodactylus. This Cretaceous pterodactyloid pterosaur known from China has a wonderfully specialized skull. It has a hooked beak with which to prize shellfish from the rocks and lever them free where they could be crushed by the broad, flat teeth at the back of the jaw. It had a long low crest along the top of the skull, with a know that stuck out of the back and this probably supported a soft tissue crest too. This pterosaur is known from a large number of exceptionally well preserved skulls and other bones from China. 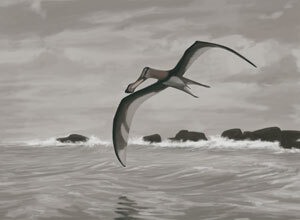 Dsungaripterus reached about 4 meters in wingspan and was probably gregarious living on the shoreline of ancient seas. Like a number of other dsungaripterids it had especially robust bones that were less pneumaticised than those of other pterosaurs. This endentulous pterosaur from the Late Cretaceous Carto Formation of NE Brazil is only known from two isolated skull. The downward curving beak was covered in a keratineous sheath with a pair of sharp blades laterally and a median keel in the upper jaw. 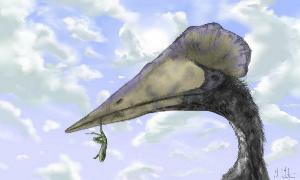 Due to the short front lever, the beak could squeeze more powerfully as in other edentulous pterosaurs. The bony head crest consists of a blade-like hump dorsal to the rostrum and an occipital process approximately as long as the entire skull. The dorsal margins of the crests fade into a fibrous seam which connects the front hump with the occipital process. Furthermore, a spike, which extends dorsally and caudally, emerges from the highest point of the rostral hump. This spike is at least one third higher than the skull and consists of mineralized connective tissue forming a rounded leading edge. The margin of the soft tissue crest likely continued from the tip of the rostral spike, vaulting caudally to merge with the tip of the occipital process. The crest was stabilised by a central lamina of fibrils, much resembling the aktinofibrils of the wing membrane. While the front and central part of the crest was likely rigid, it became flexible towards the end. The functional options of this crest, which had three fourth of the lateral face of the head is under study. Probably Tapejara imperator is conspecific with Tapejara wellnhoferi , which is only known form specimens of smaller size than . imperator and thus might represent subadults of the same species with proportionally shorter skulls and smaller head crests, possibly as a result of growth allometry. Even the mandibular crest is shared by the two. This large Early Cretaceous pterosaur is known from the Romualdo Member of the Santana Formation in Brazil from a single skull. This skull is 1420 mm in length although much of this is due to the strikingly large crest that is formed by the premaxilla growing back and over the rest of the head. An important feature of the crest is that it appears to have been well supplied with blood vessels in life, perhaps as either a means for thermoregulation or for flushing the soft tissue around the bone full of colour. Very little else is known about this animal as no postcranial elements have ever been found although it is generally presumed to have been a piscivore like most other pterosaurs. Its wing span is typically reconstructed as being between 4-6 m.
Three possible species of Tupuxuara are known from a single Lower Cretaceous deposit of Brazil. All appear to be moderately sized pterosaurs with 4 - 5 m wingspans and, when fully grown, 80 cm long jaws. Their skull is generally similar to that of Thalassodromeus but is somewhat more 'gracile' in appearance. Characteristically of a thalassodromid, the most striking feature of Tupuxuara is the large, sail-like bony headcrest that extends along the top of the skull from the upper jaw tip to project beyond and above the braincase. As with Thalassodromeus, the crest is comprised of the premaxillae, frontal and parietal bones, but the Tupuxuara crest doesn't appear to have attained the silly proportions of that seen in Thalassodromeus. That said, even complete Tupuxuara skulls have somewhat ragged posterior crest margins, so their exact shape isn't known for certain. Further differences between Tupuxuara and Thalassodromeus are seeen in their jaws: both have long and straight jawlines but, unlike Thalassodromeus, those of Tupuxara were not blade-like and their palates were noticeably distended rather than concave. Postcranially, Tupuxuara had a short, robust and apparently flexible neck and the abbreviated wings typical of all azhdarchoids. No specific feeding adaptations have been noted in Tupuxuara and it appears sensible to regard them as generalist feeders that, like most azhdarchoids, were probably very happy to forage on a variety of small foodstuffs. Folks wanting to know more about Tupuxuara and thalassodromids may want to point their browsers here. Chaoyangopterids are a relatively recently discovered group of pterosaurs that occur in Lower Cretaceous deposits of China, Brazil and possibly Africa. Shenzhoupterus is the smallest, but also the most completely known member of the group with a wingspan of 1.4 m. Like all azhdarhoids, Shenzhoupterus and its kin were toothless and possessed an unusual nasoantorbital fenestra with a reclined posterior margin that extends the top region of the opening behind the jaw joint. The rostra of chaoyangopterids were relatively broad but squat and may have had an ‘inflated’ cross section. This suggests that their jawtips may have been quite resistant to bending and twisting forces, but the slender bars joining the rostrum to the cranium are comparatively fragile and suggest that their feeding strategies could not have been to violent. Indeed, all chaoyangopterid fossils except Shezhoupterus show breaks across these bars, suggesting they were prone to post-mortem damage. 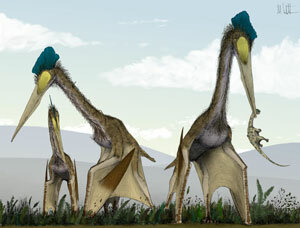 Chaoyangopterid necks are long and their wings, like all azhdarchoids, were short. 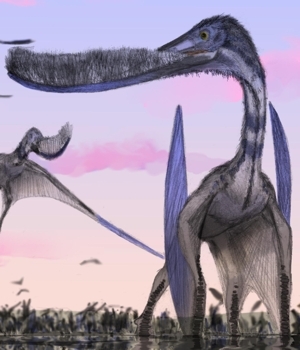 The relationships of chaoyangopterids to other pterosaurs have been somewhat controversial, but characteristics of their heads and neck suggest they are most closely related to the long-necked, often giant azhdarchids. The general anatomical similarity between these groups suggests that chaoyangopterids foraged in a similar fashion to azhdarchids, though the latter group appear to have been more successful in these habits, achieving much greater longevity and distribution than their relatives. Quetzalcoatlus northropi has the distinction of being the largest pterosaur known from significant remains (some species from Europe may have been as large, but the material is very limited and poorly preserved): the 'big wing' individual probably had a wingspan of nearly 11 meters in life. Giant azhdarchids currently hold the record as the largest flying animals known to science from any time period. Quetzalcoatlus was an azhdarchid pterodactyloid from the Latest Cretaceous. It was toothless, with the extremely long, stiff neck and oversized head typical of azhdarchids. While Q. northropi gets most of the attention (owing to its huge size), most of the material from Quetzalcoatlus comes from a smaller form, but it is not yet named beyond the genus level (and thus dubbed 'Quetzalcoatlus sp.' until further description). Partial skeletons from five or six individuals have been recovered, and thus most of the animal is known. Quetzalcoatlus material comes from the Big Bend National Park in the state of Texas, within the southern United States. It appears to have lived more inland than many of the other large pterodactyloids.